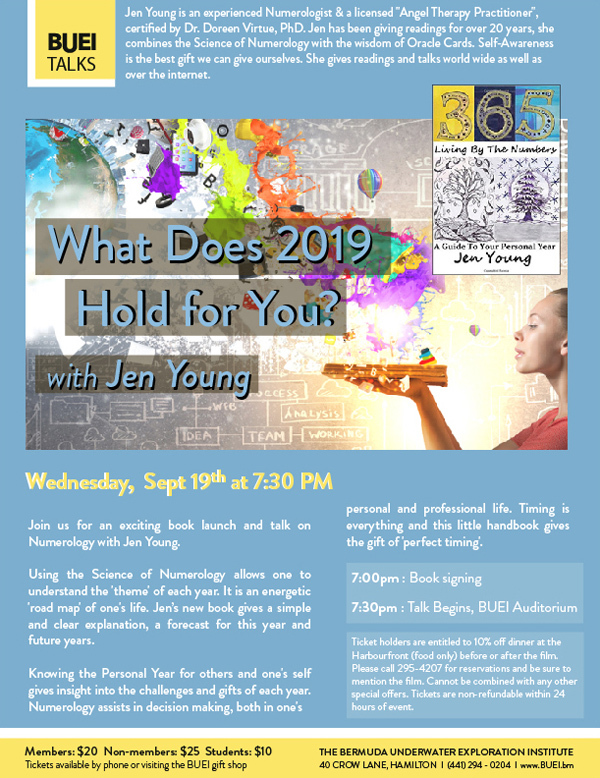 The Bermuda Underwater Exploration Institute [BUEI] will present a talk entitled “What Does 2019 Hold for You?” by Jen Young on Wednesday, September 19 at 7.30pm. The event poster says, “Jen Young is an experienced Numerologist & a licensed “Angel Therapy Practitioner”, certified by Dr. Doreen Virtue, PhD. Jen has been giving readings for over 20 years, she combines the Science of Numerology with the wisdom of Oracle Cards. Self-Awareness is the best gift we can give ourselves. She gives readings and talks world wide as well as over the internet. “Join us for an exciting book launch and talk on Numerology with Jen Young. “Using the Science of Numerology allows one to understand the ‘theme’ of each year. It is an energetic ‘road map’ of one’s life. Jen’s new book gives a simple and clear explanation, a forecast for this year and future years.